As a UFC fighter, I have to be ready for anything. Each opponent I face could use a different tactic to try to knock me out. I train with that in mind. I balance my skills and prepare for every circumstance that might arise in the Octagon. Mixed Martial Arts draws from the best of numerous disciplines, including judo, tae kwon do, boxing, freestyle wrestling and more. It was born from the realization that if you rely on only one method of fighting, you are vulnerable. You must have a full arsenal of punches, kicks and holds at your disposal. You must be able to fight on your feet or on the ground. A balance of many skills is important. The same is true for our fuel supply. When we depend exclusively on one source for power, we are vulnerable. In America, we can’t produce enough fuel to meet our own needs, and that has caused us to reach out across the world to fill the void. We go to OPEC countries, some of which are not our friends, and pay them for their oil. Because our country is so dependent on one fuel source, we are not well prepared to deal with problems that might arise in the future. However, I’m glad to see that there is some balance forming in the U.S. fuel supply today. The ethanol industry has developed a strong presence in the fuel market with corn ethanol. It’s a great start. I also see people working to get fuel from things like energy crops, corn husks and cobs, waste wood and more. I’m excited to see all of these alternatives develop and grow until our fuel supply comes from many people in many places across the United States. That’s an effort I can really get behind, and that’s why I’m honored to be sponsored by American Ethanol. We spread the word about clean fuel by bringing it to American television sets at UFC events throughout the year. Together we can help ensure that America takes a smart and balanced approach to preparing for the future. 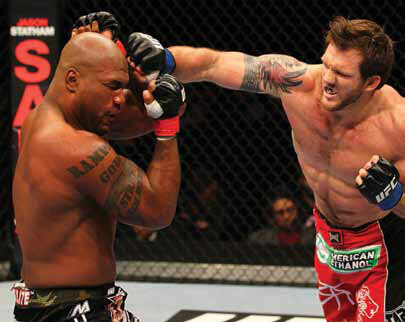 Ryan Bader is an American professional mixed martial artist. He was a cast member of Spike TV’s The Ultimate Fighter. His victory in 2008 won him a contract with the UFC and title of The Ultimate Fighter. Bader’s record is currently 15-2. His next fight is August 4 on Fox4 versus Lyoto Machida at the Staples Center in Los Angeles.